The Global Volcanism Program has no activity reports for Purico Complex. The Global Volcanism Program has no Weekly Reports available for Purico Complex. The Global Volcanism Program has no Bulletin Reports available for Purico Complex. The Purico volcanic complex consists of two ignimbrite sheets, separated by a short erosional interval, that were erupted about 1.3 million years ago, along with several stratovolcanoes and lava domes that define a postulated 10 x 20 km ring fracture. Cerro Toco volcano overlies the vent area of the Cajón Ignimbrite. A sulfur mine on its SE flank was mined until the early 1990s. The youngest lava domes, Cerro Chascón de Purico and Cerro Aspero are of Holocene age (de Silva and Francis, 1991). Both domes differ morphologically from many other flat-topped silicic Andean volcanic domes and have conical profiles. The Cerro Chascón de Purico dacitic dome was formed by a series of viscous lava flows and has a well-preserved summit crater and lava flows that show no evidence of glacial modification. The Cerro Aspero appears to be a single Pelean-type dome. 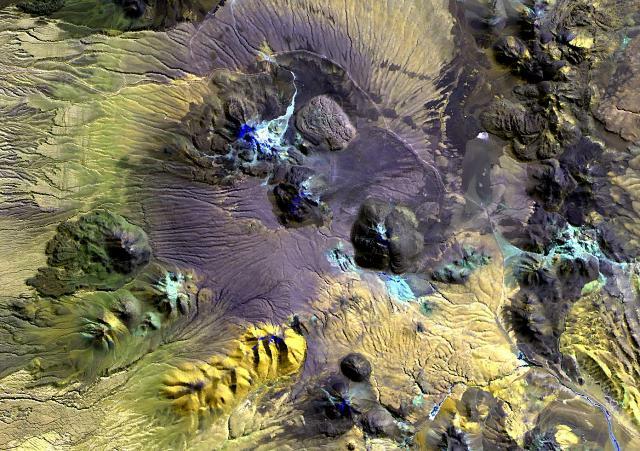 The dacitic-to-andesitic Macon stratovolcano of Holocene age lies at the southern end of the complex, and the Alitar maar at the SE end displays constant solfataric activity. de Silva S, Gosnold W D, 2007. Episodic construction of batholiths: insights from the spatiotemporal development of an ignimbrite flare-up. J. Volcanol. Geotherm. Res., 167: 320-335. Francis P W, McDonough W F, Hammill M, O'Callaghan L J, Thorpe R S, 1984. The Cerro Purico shield complex, north Chile. In: Harmon R S and Barreiro B A (eds) Andean Magmatism - Chemical and Isotopic Constraints, Cheshire, UK: Shiva Pub, p 106-123. Hawkesworth C J, Hammill M, Gledhill A R, van Calsteren P, Rogers G, 1982. Isotope and trace element evidence for late-stage intra-crustal melting in the High Andes. Earth Planet Sci Lett, 58: 240-254. Schmidt A K, de Silva S L, Trumbull R B, Emmermann R, 2001. Magma evolution in the Purico ignimbrite complex, northern Chile: evidence for zoning of a dacitic magma by injection of rhyolitic melts. Contr Mineral Petr, 140: 680-700. The Global Volcanism Program is not aware of any Holocene eruptions from Purico Complex. If this volcano has had large eruptions (VEI >= 4) prior to 10,000 years ago, information might be found on the Purico Complex page in the LaMEVE (Large Magnitude Explosive Volcanic Eruptions) database, a part of the Volcano Global Risk Identification and Analysis Project (VOGRIPA). There is no Deformation History data available for Purico Complex. There is no Emissions History data available for Purico Complex. Erosional furrows cut outflow sheets of Pleistocene ignimbrites of the Purico Complex that were erupted from a postulated 10 x 20 km ring fracture. The light-colored dome at the top center is Pleistocene in age, but the youngest lava domes, Cerro Chascón de Purico (center) and Cerro Aspero (the small dome at the bottom center) are of Pleistocene-Holocene age. The dacitic-to-andesitic Macon stratovolcano of Holocene age lies at the SW end of the complex (far left-center). The Guayaques volcanic chain lies at the upper right. There are no samples for Purico Complex in the Smithsonian's NMNH Department of Mineral Sciences Rock and Ore collection. Large Eruptions of Purico Complex Information about large Quaternary eruptions (VEI >= 4) is cataloged in the Large Magnitude Explosive Volcanic Eruptions (LaMEVE) database of the Volcano Global Risk Identification and Analysis Project (VOGRIPA).